"I just want to say Thanks! Your web site, your HD Stacker antenna and your service after the sale has made one happy customer." Unedited emails and pictures from customer"s who have purchased and installed the HD Stacker antenna. I purchased the HD Stacker installation kit a few months back and couldn't be happier. A cable subscriber for years I am a newbie to broadcast TV and had no idea where to start. I decided to take the plunge and placed the order for the kit. I just want to say thank you. The HD Stacker kit does come with everything needed to complete the install from scratch. The information on your website is invaluable. The performance is excellent! I get all the Chicago channels crystal clear. Even channel 2 CBS is received flawlessly. As I said, I couldn't be happier. Enjoying free TV in McHenry, Illinois. Don's HD Stacker Tombstone AZ. My new HD stacker was installed (by me) and working great. The unit was shipped and received quickly and was easy to assemble and mounted, and I am a old guy. I had been searching for a unit for a lengthy time and found bad ratings on almost all, until I found Denny's tv web sight. I was impressed with the testing that was done by them and the facts presented from the testing. I live in Tombstone Arizona and according to the FCC locater I have only access to a very weak signal on 3 Tucson stations ( 80 miles away) I purchased the HD Stacker and a gable end mount and pipe from Denny's. Upon their arrival I found the assemblies were complete with all needed hardware and the instructions easy to comply with, I did use a old rotor on the unit . Installation was just a few hours and upon completion I found that I get all digital stations from Tucson 32 in all counting the sub channels , the list also includes some analog channels evidently broadcasts from Old Mexico which include discovery tbs and wgn although being analog they are not great reception. We had some weather from California last week that included some 65 MPH winds and the mounts and antenna suffered no harm. I would recommend this unit and Denny's excellent customer service to anyone who needs a antenna. I have attached a couple of pictures of my antenna. Thought I would write and tell you my success story. I ordered the HD-Stacker over a year ago, and have been waiting for the person to come install since then. Finally, at the beginning of December, after Dish erased all of my recorded programs from the Hopper (the final straw with them), I gave up waiting and decided to install the stacker myself. I am 73 years old and it might be a story to share, albeit not a very long one, since it went so smoothly. Last week, I finally found a day that the weather would allow me to place the antenna in the yard. So I printed off the instructions, found a screwdriver, and put it together. No problem. It was just a giant erector set but with not as many pieces. Most of them were already done. In fact there were only 12 screws. Mounted it on a pole and took it outside and dropped it into the just retired satellite stand. Screwed the grounding block on side of house and attached cord. Came inside and started attaching the six TV's one by one and scanned channels. I had four of them perfect and then on the fifth I ran out of signal strength. So I then put the booster I ordered between the antenna and the splitter and loaded the last two on. All 6 of the TV's can be played at the same time with an absolutely beautiful picture on all of them. All of the TV's are at least 10 years old. So if anyone says they are not sure they can do it. Tell them if a woman my age can do it, anyone can. Thank you for your pre-purchase advice and support. It gave me confidence when I embarked on the installation, that I knew I could call you, if I needed too. Denny...had to send you a picture of the HD STACKER antenna in my Living room, just mounted it here until the weather breaks, then it goes on the Roof, don't know how long the Wife is going to let it stay in here...ha....Just wanted to let you know, the Picture is better than my Satellite Company was, I' m getting 100% on NBC, 85 to 90% on all others, CBS, ABC....the tower's are about 40 to 45 miles from here...great product....Now I'm saving $100.00 a month...Weather has been brutal here in Northeast Ohio, probably the same for you in Michigan....I will send more pictures, when its mounted on the roof.........Casey.. I ordered the HD Stacker, five foot tri-pod, and the five foot mast pole. All arrived on the third day after being ordered. I must admit, I was surprised when I opened the box and seen the HD Stacker. I wasn't suspecting what I was seeing. I figured it would be another light weight antenna that might last a couple years. This antenna is the most heavy built one I have ever seen. I never got to the roof with the antenna. It is setting in my back yard on the tripod with the five foot mast pole, and receiving every available channel we can receive here in the Southern Missouri Ozarks. Some of the transmitters are about 60 air miles away. I will leave it there for a while to make sure it continues to work like it does currently. If it does, I guess I will be digging about three holes to pour some concrete into and them and bolting the tri-pod down near to where it sits. We couldn't be more happier with the HD Stacker. By the way, just talked to a guy this afternoon who was at a local electronics place that sells antennas. He didn't find what he wanted. I told him about the HD Stacker and gave him your number. I suspect we'll be getting in touch with you soon, he had just canceled his Dish Network. Have a good day. Chet. Denny, I was recently going through some papers and came across the invoice of my purchase of the HD Stacker antenna. It's been 5 years since I made the purchase. When I called to order you told me it was brand new to the market and I was the first customer to order this antenna. I'm just writing to tell you that after 5 years the antenna is still working great. We have had strong winds, ice, snow, and severe thunderstorms and the antenna survived it all. It's working as good today as when I installed on the roof 5 years ago. Thanks for high quality product and good service. Denny, Your HD Stacker is one amazing antenna. Two years ago I bought the Antennacraft CCS1843 extreme deep fringe antenna. The antenna is a monster at 15 feet long and when installed it sagged at both ends because of its length. In my area the Rockford channels are easy to get but I also wanted the Chicago stations. The CCS1843 with preamplifier got most of the Chicago stations but I did't like it on my roof because of its size. I came across your HD Stacker design and with some hesitation thought I would give it a try. The HD Stacker has been on my roof for about a month and I couldn't be happier. It's less than half the size of the CCS1843. When I installed the Stacker I didn't change anything except the antenna and I now get slightly stronger signals and 2 more channels. With the CCS 1843 I couldn't watch CBS 2.1 now it comes in all of the time. preamplifier and Eave Mount installation. Great job Bill. I am the envy of my neighbors because I get 4 more channels than they do and the picture is perfect! Thanks for a great product but more importantly your customer service. I have included two new pictures of my installation that you can be proud to share. I have two neighbors who are going to buy your antenna come spring (they are snow birds and leaving for Arizona) lucky dogs. Thanks again, and thanks for making my installation successful. 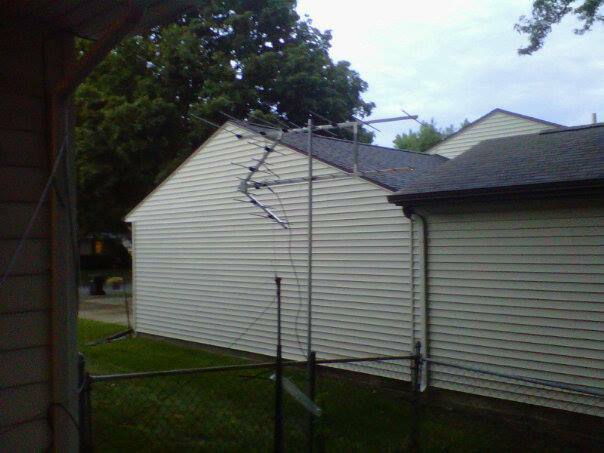 Mark's HD Stacker TV antenna in South Haven, MI. Good morning, Denny and crew! Mark _____________ here from South Haven! Last December, I drove to your shop in Ithaca to see the HDStacker antenna and to hopefully talk with you. You were out…so I spent some time with your wife and her father in the shop. She may remember me as “the TV 9 & 10 guy,” since I had mentioned I worked there as a reporter and photographer from 1973-1977. Anyhoo…I purchased the HD Stacker kit with rotor and pre-amp, and erected a 50’ refurbished Rohn tower and had the antenna attached atop over the weekend. After making all of the connections, we did the initial scan on the main living room TV set. The first station that popped up after the scan was WBAY-TV in Green Bay, some 160 air miles away from the Green Bay antenna farm! WFRV-TV was also there, as well as the expected locals in Grand Rapids-Kalamazoo (WWMT, WXMI, WOOD, and WZZM) and stations in South Bend (WNDU, WSBT, and WSJV). We split the input signal to a second TV in my basement home studio and two FM radios, with similar outstanding results. As a TV DXer, to say the least, the HD Stacker has made my hobby more enjoyable and is everything you have claimed it to be and more. I have attached a couple of photos of the full tower installation and a close up of the antenna in service. I ordered the Stacker last spring, installed it on my fish house in storage at Mille Lacs Lake in Minnesota. The first test was this week on the lake. The Stacker works like gangbusters. We receive all of the Twin Cities stations UHF and VHF at the green level during the day and blue level at night. The scale being bad to good red, yellow, green, blue. With the old antenna "12 feet long" we were either red or non - existent during the day and yellow or red at night. The 2 High VHF stations were especially bad. The distance straight line to the transmitters is 88 miles. We're running 35 feet of coax cable directly from the antenna to the TV. Update from Bill:The Lions/Vikings game on 1-2-11. 88 miles line of sight to the transmitter, solid signal with Stacker on our fish house on the ice at Mille Lacs lake. Have not had a single dropout day or night on any of our stations. We get all networks, 28 channels including sub channels. Take care and good fishing. John's HD Stacker attic mount. Lamont, IL. This is my attic installation of the H D Stacker. I am now able to receive 52 channels and 85% of them are at 100% signal strength without any amplifier, this is a gain of approximately 35 to 40% from my previous measurements. The antenna is well made and the assembly was painless. 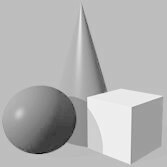 If you notice, the antennas are not joined together. This allows me to aim the VHF and UHF beams independently. Thank you for all of your help and a great product. I made a slight mistake with that email I sent you along with the picture. With my old antenna I received 51 channels, with the HD Stacker I am receiving 72 channels. Sorry for the error. Nice surprise to see my picture on your website. 70-80 miles north of the Twin Cities in Mn. Like all antennas to receive a signal at 70-80 miles will depend primarily on the terrain between your location and the TV transmitters. If the HD Stacker can't do it likely no antenna will. I can check it out if you send me the street address of where the antenna will be installed. Denny, I am 20 miles south of Mille Lacs Lake, (and closer to transmitters) so the report that you sent was very helpful. I am going to order a Stacker from your site online. We have the antenna installed and are getting many more channels now. Probably 7 or 8. We received absolutely ZERO before, so this is quite an improvement. We even get FOX. We have one more improvement to make and that is removing this relic of a splitter that we do not need. Pictures attached. The cable coming down from the antenna we reused and it is also cheap and old. We are ordering some new cable and hope that makes a difference as well. The picture is quite stable and only rarely flickers now, and only then in high wind and rain. Now my family is greedy! haha. They want to maximize all potential weak links and harness as many channels in high quality as possible! Just wanted to thank you for your wonderful products. I knew we were getting good service from the EZ HD for the last few years, being as far as we are from Portland. I finally got around to ordering the HD Stacker and replaced the EZ HD this weekend. The assembly was straight forward thanks to the online link you provided. The signal improvement is everything I had hoped for. Went from one yellow bar too 4 green bars on our station that had been intermittently dropping out (12 out of Portland). All other stations showed the same improvement, and we picked up 4 more stations to boot. And all of the above, including the EZ HD I removed, cost less than a few months of cable or satellite. Thank you again for such wonderful products and service. Just writing to let you know that the HD Stacker is great option for people living in Toronto. When several Toronto channels switched to high VHF, my Channel Master 4221HD stopped picking up a lot of Canadian stations. The combination of two antennas in the HD Stacker seemed like a solution and I can tell you it is. I get channels I didn't get before. I regularly get NBC (UHF channel) which I never used to get. Given that your antenna is made in USA there are no import duties or any import/export problems whatsoever. It arrived fine, it's works great, my antenna problems are solved. Dave's HD Stacker in Lindhurst IL. WELL,... ANYHOW YOU NEED TO KNOW THIS ! ! ! Denny, here's my Hd Stacker antenna review. I just wanted to write and let you know how satisfied I am with the new HD Stacker Antenna that I purchased from you. I live just about 60 miles N/W of Indianapolis, IN and I am picking up the TV stations from the South side of Indianapolis. I was using a big old flat head antenna on a tower and I am now seeing 4 TV stations I had never seen before. I had a WinegardAP8275 signal amplifier on hand and put it on the system. I actually had to remove it because it was overwhelming my distribution system to my TV''s. With no amplifier and only using the HD Stacker antenna itself, I have crystal clear TV in all locations at my place in the country. I am so pleased I researched all of this out and found that Denny was correct, it is the best HD antenna out there and he deserves the bragging rights! Larry's HD Stacker Waterloo IA. "Here is my temp. antenna setup - not very high off the ground"
I received the antenna today. I LOVE IT! Had a thunder storm move in just as I was finishing up assembling the antenna. I strapped a 10 foot mast to my chain link fence to try it out. I got my compass out and roughly aimed it at KWKB - the Antenna TV station I was after (72.5 miles). SWEET! So I aim it towards Des Moines - do a scan.... WOW! Des Moines is about 232 degrees and I am getting WHO TV - 79.2 miles which also has Antenna TV! ALSO I am getting the Mason City KIMT which is at 344 degrees! I am also getting Fox out of Des Moines and some others too. Now mind you this is only 10 feet off the ground - between my house and neighbors garage! Roughly aimed too! So I am excited to get a rotor and raise the antenna up higher on my roof - will be up about 15 feet. I will snap a photo of how it is now and the distance I am getting! I LOVE this antenna! This is not like all the others that are hype. I am telling all my nerd...er ham radio friends about this antenna! I will let you know when it is up on the roof. THANK YOU again! On Saturday March 24th I ordered your HD Stacker antenna, 5 foot tripod, mast and Winegard preamp. All received on Thursday the 29th. I installed the antenna on Saturday, after hooking it up to Magnavox DTVconverter and running a channel scan, we were receiving all of the main Twin Cities stations. Now with one of the stations we had a signal meter reading showing 44%. My wife at said at this point something about how well the picture was. Then I said that I haven't even plugged the pre-amp in yet! Needless to say all the main channels are in the 80 - 90% range, even the low powered stations are coming in great. As a bonus I was picking up stations in Austin and Rochester, MN. and also from LaCrosseWI. (they are very weak and weather is what helped get these to even show up). But still, picking up stations 150 miles with the antenna not even pointed at southern MN! I would like to say thanks for all of the helpful information and your honesty in not over exaggerating your products. It's nice to have something perform better then claimed, and that's exactly what I'm seeing here. Purchased your HD Stacker last month. I had it professionally installed. The installer at first was skeptical of its performance because of its small size. I assured him that it was highly recommended. Hello Denny, Rhonda, Tony, Jeff, and Andy....My name is Dominic and live in Fairfield, Connecticut. finished the install and cannot believe the number of channels received in my neck of the woods. I am able to pick-up over 40-channels crystal clear and with previous antennas I was lucky to get 8-10 channels. products that you provide and once again all I can say is THANK YOU! On a separate note your web page is one of the best that I have come across...dedication to detail is beyond words !!!!! I have attached several photo's for review, feel free to use them sharing with others on my experience with your services. Dear Denny I wanted to thank you for the great antenna . This summer I got a HDStacker from you and a channel master rotor. Well I had it on the ground on a pipe, well this weekend I got my 32 feet tower up with the HD Stacker on it, I have the 8700 amp on it , I'm happy to say that I'm getting 28 channels in York PA. Some of the surprises are stations coming from a far, are WCAU in PHILLI 78 miles away, Baltimore WJZ, WBAL 43 miles away WI4FDF-D Elliotsburg PA 44 miles away, WHAG Hagerstown MD 70 miles away,and WJAL in Hagerstown too 67 miles , But the best one that was weak but could see it for a little while was WWPX in Martinsburg WV 80 miles away, WOW FANTASTIC ANTENNA your HD Stacker. I would like to send you a picture maybe later. I hope you can use this as a testimonial for you antenna . I may be sending a few other folks your way to get the same antenna. Thank you . Jim McG. Gerald's HD Stacker installation in Rudolph, WI. I just got my HDStacker antenna up and running with a Channel Master 7777 signal booster. No rotor. I mention that because... when I scanned my TV for channels it received one channel over 80 miles over away on the back side of the antenna. Now that's not bad for something that isn't expected to be there. It's channel 51 out of LaCrosse Wis. which is S/W of my location. I have the HD stacker pointing N/N/E. The stacker antenna is installed. I'm getting more stations than I should as I did not use a rotor. HDquality is great with OTA signals. Your website and the printed installation instructions made it easy. It took a while but just before the Canadian market switched to digital we upped the tower with our new HDStacker complete with rotor and signal amplifier. Plugged it all in and presto-chango we have more than a dozen channels all with great reception. Oddly enough when we called to cancel satellite they stated that we wouldn't receive any signal after the conversion to digital (September 1st 2011 up here. I tried to explain how over-the -air reception would still be possible but I could not make my point-either the customer service people truly believe that OTA reception is not possible or they deliberately mislead customers? Anyway the system works great and the installation instructions on your website helped with some of the details. Thanks for your patience and help. Very happy with the HD Stacker. Picking up Canadian DTVchannels 75+ miles away. Detroit and Buffalo also. Improved local reception too. 30 feet from the ground with a Winegard distribution amp. feeding 3 TV's per your suggestion. We received the antenna and pre-amplifier yesterday and today we installed it. When everything worked as Denny said it would, my husband John said, "well, it looks like the blind hog finally found an acorn", one of his favorite quotes when something goes right. We positioned the antenna small end toward the East as Denny instructed and re-scanned the TV stations and was able to get all major networks and a lot more stations, in all we got 17. We won't know how to act since we have not had any real TV in over two years since we moved from Austin Texas. Now I can cancel Netflix script since I had to rent our TV shows from them & they were last years shows anyway. Please extend our thanks to Denny... he really knows his stuff + we are going to promote you guys to folks around here since a lot of people hate the high cost of cable and satellite. Please send me some business cards. We're keeping the one you enclosed for our own use in case we ever need anything again. Thanks again, you guys are life savers to an old retired couple. Last may I bought the Stacker HD antenna and it is working out great. I can receive the stations from Toronto I wanted and I didn't even have to mount the antenna very high from the roof. Thank you for making an antenna that really works!!! Hi Denny,I just wanted to let you know how pleased I am with this wonderful antenna. I purchased one of those Chinese (guaranteed 150 miles) antennas to replace my old very large antenna. The size and range attracted me. OK I learned my lesson. I am a 72 year young woman who assembled this antenna in my kitchen and with the help (muscles) of my grandson put it on the existing mast. When I scanned after positioning the rotor I was shocked to get 60 channels. The Chinese thing got 14. My old large antenna did better than the Chinese thing (which is now in the garbage) Channels which had been foggy with my very old large antenna became crystal clear. I am so delighted with this antenna HD stacker. LOVE IT! I live outside of Rochester by Lake Ontario and so far I get Rochester, Buffalo, Ontario and Toronto... I bought the indoor rotatory thing (Channel Master 9521A Rotor) and these are just the directions I have checked. I pick up about 16 channels at each of these headings which includes, of course free HD. My brother in law did all of the installation and did a beautiful job. I will be passing out your web address and am 100% satisfied. Denny's a genius. Please feel free to use my HD Stacker antenna review on your website. I recently purchased an HD Stacker from you. (back in June) I just now have gotten around to getting it installed and it has far surpassed my expectations. Just wanted to thank you for all your help and assistance. Thanks Again. I just wanted to let you know how pleased I am with my HDStacker Antenna. I live in an area where I am not supposed to be able to pull in any signals at all due to the distance and terrain. I am now receiving channels 2-13 and many higher channels which includes PBS channels. I was able to install a short 3 foot mast on top of my 2 story home and just point the antenna in the general direction of the transmitting towers located approximately 110 miles away. I do have signal amplified mounted on the mast and most of my channels are showing signal strength between 75% and 85% and 100% signal quality. I have canceled my subscription to DirectTV and I am now saving $100 per month. Thanks again for offering this great product. Just wanted to thank you for a great product, and fast service. I ordered your HD Stacker on Saturday the 25th, & received it on the 29th. My wife & I had it assembled, mounted, & watching TV in about 2 hours. We live 45 to 60 miles from Evansville, IN. We're getting good strong signals from both VHF, & UHF stations. Here's a picture of the antenna. I received my new antenna and pre-amp (HD stacker and Winegard AP-8780) on 16 June. I installed everything the next day. I've waited this long to contact you so I could give you an honest opinion as to how my new stuff works vs. my old stuff (we've been getting "free TV" for 10 years) We live out in the country and IAW the "gov" web site, the available TV stations are in Augusta, GA and Greenville, SC, bothareas are 50-70 miles from us. Usually, when the wind blows or a storm is within 30 miles of us, our TV reception goes somewhere.........other than to our TV. I've had my new stuff installed about 2 weeks now, been through 5 severe thunderstorms with strong lightning, 55 mph winds and I still had great TV reception on most channels! All I can say is, "Damn, what a great antenna and pre-amp." Also, I want to tell ya'll that your web site is great! I'm 65 yrs old and my son calls me a "tec-no dinosaur" but I had no problems getting around your web site and understanding just what I needed, and thanks to you my understanding of free TV airwaves and how everything works is up to date. One calm and clear night last week, I turned my antenna towards Atlanta (120 miles away) and picked up 3 of their channels. Of course they weren't there the next morning. Right now I have 27 channels, ABC, NBC, FOX, CBS, 6 PBS stations from Ga, SC and NC. I feel like I got "Free Satellite!" TV. My 90 year old Mother-in-law lives with us and she's happy.....she can watch her "soaps" with no interference while she "naps"! Ya'll have a great day and thanks again! Please post on your website my HD Stacker antenna review for other potential customers. After spending many hours of research on Denny's website (absolutely no other information source comes close), I decided to arrange for an installation. It's been two weeks since Tony and Denny completed my HDStacker installation. (At age 66 I avoid ladders and roofs.) I originally told Tony that I was hoping to reach the stations in both Toledo and Detroit, over 100 compass degrees apart, but with an emphasis on the farther Toledo stations that are about 45 miles away. I was thinking about having a Stacker and and EZ installed on the same mast, and Tony methodically configured an array accordingly, taking a generous amount of time in the interest of precision. He explained everything about his approach and was obviously very knowledgeable about antenna and amplifier configuration. Tony initially did a trial install on a lower roof, but was not satisfied with the performance. However, accessing my upper roof presented unforeseen challenges due to a very hot surface on a very warm June day and a full array of solar panels previously installed. So Tony rescheduled for an early morning next visit. To my surprise, both Tony and Denny showed up a week later to complete the installation. The two of them worked out an access plan based on discussion, determination, and logic. Placing just a tripod-mounted Stacker on the difficult-to-access upper roof did the trick. Based on their recommendation, I was able to avoid the double antenna array and a more expensive pre-amp. With just the Stacker aimed at Toledo, I now receive all of those 45-mile-away stations full strength, and almost all of the 35 mile away Detroit stations at half signal strength (but full digital clarity), even though the Stacker is not aimed in that direction. Our best TV (a 55 inch Samsung) presents an absolutely stunning picture in full digital clarity. Up on the roof, the six foot long Stacker is not the monstrosity that other antennas are. Denny loves to talk, and presented a wealth of information on antenna design and performance based on a lifetime of experience. He explained how he designed the Stacker and had Winegard do the testing. Loves his profession, as does son Tony who is also very competent. This note is just to emphasize that I am a very satisfied customer regarding both service and equipment. My basic cable service is now canceled and my savings will pay for my equipment and installation cost in a couple of years. These guys are total professionals and this is one of my most memorable great outcomes in paying someone to do an excellent job start-to-finish. I received the Stacker a few days ago and I coordinated with my brother the install. The install went great! What a wonderful antenna! My brother is a ham radio geek and he loved the design (we recently built a Wifi Yagi antenna for a friend that's working unbelievably well) and most likely he will be buying one soon. It was a pleasure Denny and will definitely recommend you and your antenna to anyone who will listen. I live in Dillon Beach, CA and I am 60 miles from San Francisco. The FCC reception map has me in the red for all but a couple of local stations. I have the Stacker mounted in a small attic that it barely fit in and I get the red stations from San Francisco galore and perfectly. I get channels 2, 4, 5, 7, 9, 11, 20, 22, 38, 44, 50, 60, 65 and more. Thanks for the great product! It is awesome and I love it. I wanted to let you know that I received and installed my new HD Stacker antenna and preamplifier. we were tired of paying our ridiculous DirecTV bill each month so we began looking for alternatives. We live in a very rural area of Southwest Arkansas and were hoping to just be able to receive the three major network stations out of Shreveport (about 60 miles away) with an antenna. We decided on your products mainly because you responded quickly to my email request for information. We are EXTREMELY pleased with the results! Not only are we receiving the three stations we had hoped for, but 14 others as well! Thanks for your help! I have friends and family that are considering ordering products from you also. Right now the antenna set up I have is Clearstream DB8 and a C5 VHF antenna to a VHF/UHF combiner then to a AP 8275 pre-amp. Total cable run to a 4 way splitter is about 30'. From the splitter to the TV's ranges 20' to 35' max. I have the antenna looking towards NYC. It works nice but it looks big plus the last wind storm we had it came down. I think due to the fact the back screens caught most of the air. Now I am looking at your HD Stacker due to the smaller size of the antenna and from the performance charts it may fit the bill. Second email 3 days later. Got the Stacker antenna this morning just finished installing it. I am seeing a 10 to 20 percent -+ 5% improvement well worth the money. Denny, Thank you for the antenna, I spent Saturday in the misty rain and wind putting it up. I have enclosed a picture. The instructions were easy to read and there was no trouble putting it together. I must admit that I thought because of the small size of the Stacker, I had my doubts of the performance. Upon turning it on I was amazed at the reception. I am passing you and the antenna around at work as to how great it is. Thank you for such a great antenna, I am impressed. HD Stacker antenna ...Put it up...works great...problems gone...As a Ham radio operator I give this antenna a thumbs up. Yesterday I installed the Stacker antenna that I purchased from you. It replaced a Radio Shack 10' antenna. My signal improved by 40%. The HD picture quality is outstanding! Thank you for delivering the antenna quickly and for providing quality products for people who are fed up with overpriced cable and satellite subscription prices. Finally got everything installed. Made the switch from cable to the HD Stacker antenna over the weekend. All 3 TV's have unbelievable pictures even the 42" plasma. Don't think there's any need for an amplifier. Thanks for the recommendation and great service. Thanks Denny I am Very Happy with my HD Stacker Antenna it performs even with snow. We had wind gust up to 57 MPH and did not loose a channel. We have had hard rain and have not had one channel drop with bad weather so far!!!! !